Designing a country garden is an exciting project if you love open spaces, rustic charm, and want plenty of room for plants. But large-scale landscaping has challenges beyond the sheer amount of space you have to deal with. In a city garden, you want to screen poor views, block noise and create privacy. However, in the country, usually your goal is to keep good views open, but the desire for openness can backfire. Unless you plan carefully, your property might simply be wind-swept and bereft of any sense of intimacy and enclosure. The key issues acreage owners face when designing a country garden are creating attractive enclosure and gaining protection from the elements, while keeping a sense of openness and a harmonious blending into the surrounding landscape. As in any garden, the landscaping style you choose will depend on your house. For example, modern buildings with clean simple lines call for bold plantings – massed perennials and grasses, and trees planted in a grid formation or as line. But an old-style farmhouse might better suit a casual cottage garden with trees and shrubs arranged less formally in undulating island beds. Even if you are hiring a landscape designer, try to have an overall picture in mind that reflects the feeling you’re after. Look at gardening magazines and books for appealing garden ideas, and start a file of ideas. Proportion and scale: Scale is always bigger in the country. Plant trees and shrubs in groups or lines. Don’t made patios, pergolas or decks too small. Don’t forget shelter from the elements: If you need to plant a shelterbelt or windbreak with trees, don’t crowd them at the house. Windbreaks provide best protection when planted to the north and west about 20 to 30 yards (20 to 30 metres) from buildings. Be creative with your space: If you have lots of privacy, the “backyard” doesn’t have to be the outdoor living area if the front is better because it’s sunnier or sheltered from prevailing winds. A patio on the east side, might be an inviting spot for morning coffee, while a west-facing courtyard would allow evening entertaining and while catching the sunset. If you can manage it, why not include both? Wide-open spaces are all well and good when designing a country garden, but you want areas near the house to be inviting. A courtyard, deck or patio, and pergola-covered spaces can all be used for outdoor living. To soften and enclose these built areas, plant trees, shrubs and perennials. Avoid putting hard material (say a stone patio) up against another hard material (the house wall); try to have a planted bed in between. Blend your landscape with natural surroundings: Beds, plantings and structures close to house can have a more cultivated or formal feeling, but as you get further from the house, allow the landscape to be looser and more naturalized. Research plants that are native to your region, and integrate as many native trees and perennials as you can. A wild flower meadow is ideal for an open, sunny spot. Use local stone and wood. You might be able to reuse old wood or stone in your project. Natural stone is a perfect choice for patios, paths and walls. Use what’s on site if possible. If you’ve removed trees to build a house, the wood can make split rail fencing or a rustic arbor. Incorporate found rocks or collect from surrounding properties. (Do this with permission only: sometimes farmers will often let you have rocks inexpensively or for free.) 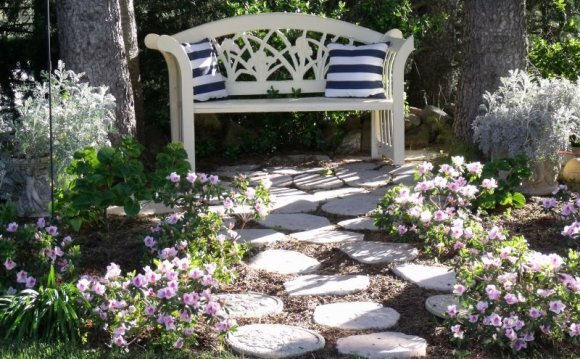 Rocks can line beds, outline paths or be used for retaining walls. If you need to keep wildlife out, use wire fencing set on round cedar posts. (To keep out deer, fences need to be at least 8 feet (2.5 meters) tall. Use vines to soften fences, e.g. hops, climbing roses, honeysuckle, grapes or clematis.